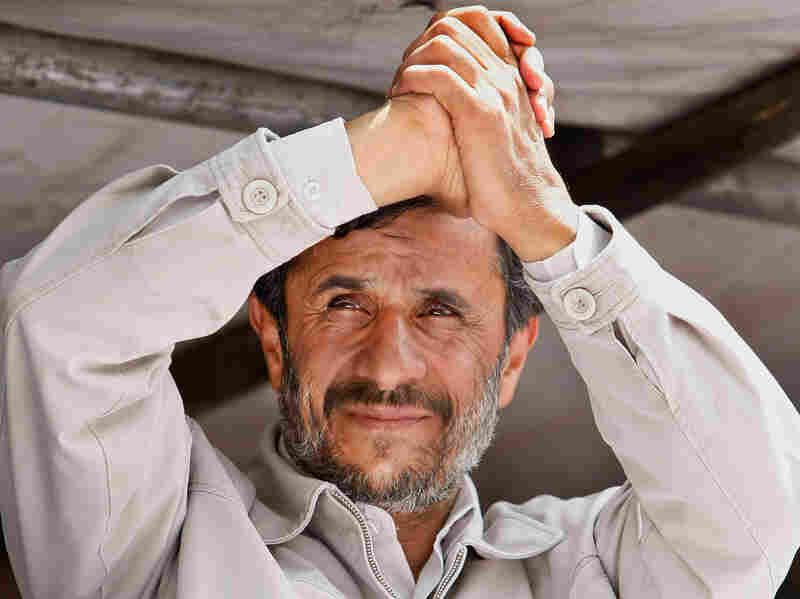 The Resolute Ahmadinejad Knows How To Survive Iranian President Mahmoud Ahmadinejad's supporters believe in him with good reason: He has helped them, and they have in turn put their faith in his leadership. Iranian President Mahmoud Ahmadinejad gestures to thousands of supporters at his final election campaign rally on Azadi Street in western Tehran, Iran. For another perspective on Iranian President Mahmoud Ahmadinejad, read commentator Melody Moezzi's recent piece on his remarks at the U.N this week. The first time he ran for the presidency of Iran, while careful not to offend the establishment, he said all the right things to get elected — promoting economic and social justice, cash payments from oil revenues to families in the name of equity, eradication of corruption, better educational opportunities and health care for all, an Iran that could defend itself against foreign aggression, and no compromise on Iran's right to nuclear enrichment. His tactics worked. Mahmoud Ahmadinejad realized that he would never appeal to the elite minority among Iran's close to 70 million inhabitants; Iran simply did not have enough cash to support everyone when he was elected. He has become the champion of hardliners. In a smart move, he opted to favor the disenfranchised, the rural and the inner-city poor, the Iranian Revolutionary Guard Corps and the hardliners. He made frequent trips to poor villages, gave cash handouts and financed popular projects (all without parliamentary approval). He awarded government contracts to the IRGC — frequently, contracts that the IRGC itself could not implement but used as a means to get corrupt commissions from foreign partners. In the process, IRGC officers enriched themselves beyond their wildest dreams. Ahmadinejad ordered the heads of Iran's central banks to simultaneously increase credit and reduce inflation and interest rates from about 25 percent to single digit rates, all to help the poor. Some central bank heads resigned, and others were fired. He attacked Israel and the United States as never before and advanced Iran's nuclear program. But in the process, he has squandered Iran's oil revenues and driven the economy into the ground. Inflation and unemployment hover around 20 percent, and foreign exchange reserves are depleted. There is little hope for turnaround. Despite this, the IRGC and the poor continue to love him. He has become the champion of hardliners. As polls have revealed, he is the first Iranian president to become a favorite regional leader (along with Hassan Nasrallah, the leader of Hezbollah) for oppressed Arabs in the Middle East. Ahmadinejad's primary backers have demonstrated that they will imprison, torture and kill to keep their man in power. A recent poll by the World Public Opinion group revealed that most Iranians support Ahmadinejad and the country's nuclear program, even as they advocate building diplomatic relations with the U.S.
For now, Ahmadinejad has survived! But he, and indeed the entire regime, is more vulnerable than ever before. The only way the regime can survive is as an absolute military dictatorship. The U.S. should not come to the rescue by making concessions in the meetings that are scheduled for Geneva on Oct. 1. Instead, the world should support the struggle of the Iranian people — then we shall see how Ahmadinejad survives.